No. 8/10 Virginia Tech (15-3, 4-2) will return to action on Saturday when Syracuse (14-5, 5-1) visits Cassell Coliseum for a night game on ESPN. It’s been an odd season for the Orange under long-time head coach Jim Boeheim. They were beaten by a pair of 11-8 teams – Oregon and UConn – despite having a homecourt advantage at Madison Square Garden. They also lost at home in the Carrier Dome to Old Dominion, a solid team, but a team that shouldn’t beat Syracuse on the road. The Orange were soundly beaten at home over 40 minutes by a Georgia Tech team that struggles to score. They followed up that loss by beating Duke in Cameron Indoor Stadium two days later in a Big Monday game on ESPN. Since then they’ve won two games they should have won at home against Pitt and Miami, but on the whole it’s fair to look at Syracuse and wonder which team will show up: the one that won at Duke, or the one that lost to several mediocre teams. 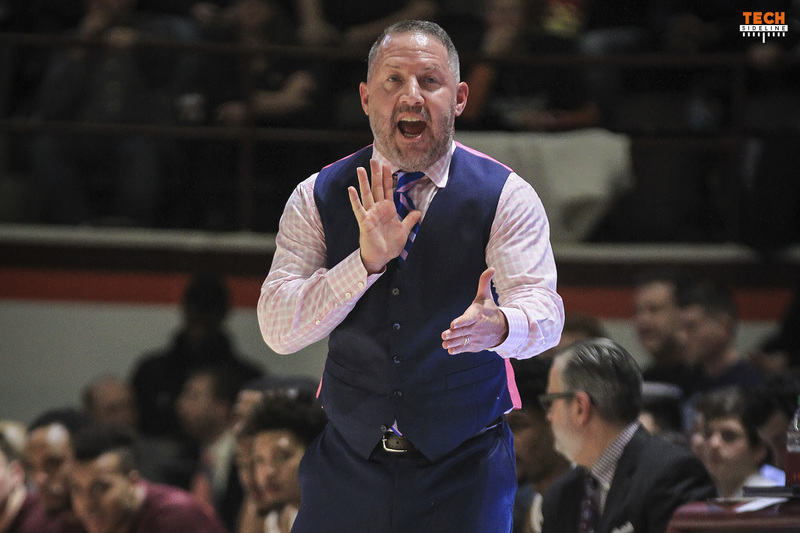 The Orange will bring their familiar zone defense to Cassell, but the Hokies have already seen that defense this season. Washington head coach Mike Hopkins was a long-time assistant under Boeheim at Syracuse, and he’s taken that zone defense with him out west. Virginia Tech beat Washington 73-61 in Atlantic City back in December, and the Huskies are having a good year. They are 15-4 overall, and a perfect 6-0 in the Pac-12. G Frank Howard (6-5, 205, Sr.): 7.1 ppg. Howard is a below average shooter, but he leads the team with 24 steals and 55 asssits. G Tyus Battle (6-6, 205, Jr.): 17.8 ppg, 3.2 rpg. Battle exploded for 32 points in the win against Duke. He’s not a great outside shooter (28.9%), but he’s a very good player. F Elijah Hughes (6-6, 215, Jr.): 15.3 ppg, 4.5 rpg. Hughes has made 52 three-pointers this year, more than twice as many than any other player on the roster. F Oshae Brissett (6-8, 210, So. ): 13.4 ppg, 7.6 rpg. Brissett is the team’s best rebounder. Shooting at a 37.8% rate, including 28.2% from the outside, he probably shoots too much. C Paschal Chukwu (7-2, 228, Sr.): 4.3 ppg, 6.2 rpg. Chuckwu starts, but plays fewer than 20 minutes per game. The Orange have been able to get to the free throw line a lot, however. 21.5% of their points have been scored from the free throw line this year, which ranks No. 51 nationally. They are No. 147 in the country in points from three-pointers. However, in ACC play, those numbers have flipped. They are first in the ACC in conference games in points off three-pointers (42.9%), and only No. 13 in points off three-pointers (15.7%). They’ve been a horrible three-point shooting team all year, until they started facing better competition in the ACC. That’s a turnaround that you don’t see very often. Can it continue? The Orange make it very difficult for their opponents to get a good shot, and they also force a lot of turnovers. Strangely enough they allow a lot of offensive rebounds despite their length, though Virginia Tech probably isn’t the type of team that can properly take advantage. If the Hokies win on Saturday night, they’ll be 16-3 overall and 5-2 in the ACC, and in good shape as they move into the middle of their ACC schedule. Which means they will shoot 19-20 from the 3 Pt line against us. Just kidding. Sort of. Hey Chris, thanks for the projected starter player stats. Need a big crowd and everyone has to knock down 3s. We’re going to live & die by the 3 from here on out. Chris: Biggest word in the last paragraph “IF.” My Grandfather told me “if” was the biggest word in the English language. Hope the Hokies can win. Let’s not make fools of ourselves two games in a row on prime time tv. . .
Can they actually track to see if a team makes it hard to get off a good shot. I find that lower shooting percentage is often associated with the defense causing it when it is not necessarily the case. A team can miss open, non-rushed 3s all night and not because of the defense. Just asking if there is something that can accurately look at and track if the defense actually makes it hard to shoot?